This post should have been written months ago during the Lunar New Year season. Reason being this dish is always on the table at the annual family reunion dinner. ‘Leek’ in Mandarin is suan, which sounds just like the equivalent of the word ‘count’. In essence, it’s an auspicious dish to consume during the festival celebrating luck and prosperity. 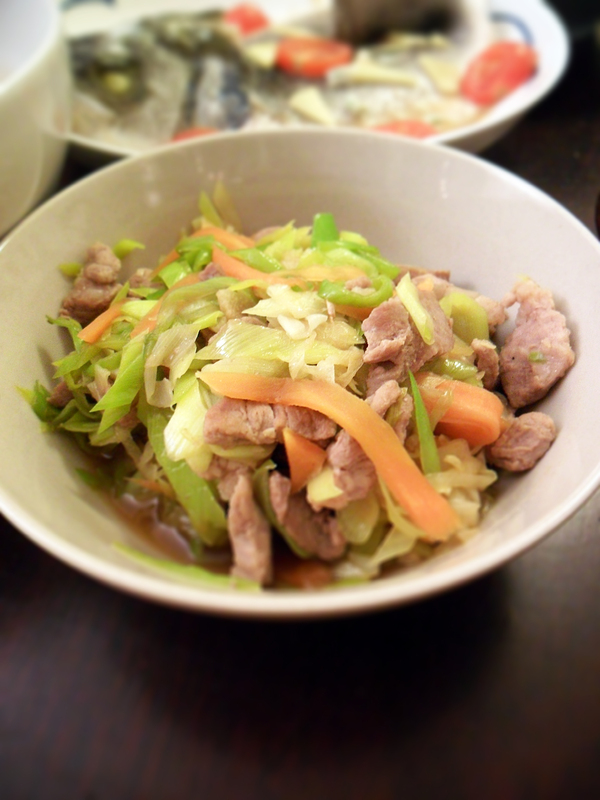 That aside, leek and pork is a lovely combination. Cut up the vegetable to thin slices, diagonally. Separating them to loose strands gently. Do the same with a carrot, or pass it through the coarse side of a grater. Prepare the pork this way. In a hot skillet with a tablespoon of vegetable oil, toss in minced garlic and fry till fragrant. Add in the vegetables and fry about with a small splash of water. Lower the heat. When the leek is almost completely softened, add in the pork. Turn up the heat and stirfry everything together by adding water in small quantities, frying till dry-ish each time. Adjust seasoning accordingly with light soy sauce. 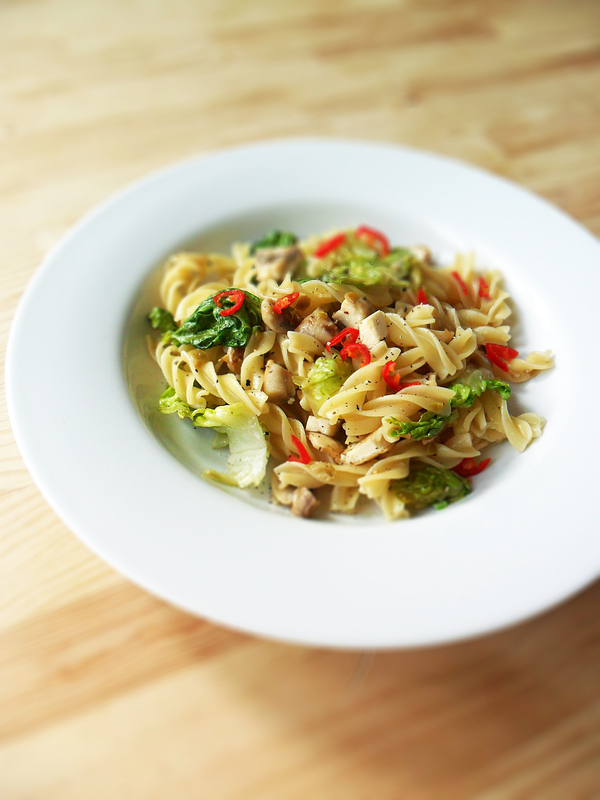 Another one to add to the vegetarian recipe list, this is a great dish to whizz up if you wanna have both pasta and that salty Asian flavour. Usual drill, set your fusilli boiling away in a pot. Add torn mushrooms and cubed hard-skin tofu, frying till golden. Tear in a handful of gem lettuce for the texture of sweet crunch. Turn of the heat. Drain pasta, and together with a small bit of pasta-cooking water, add to the skillet. Add a teaspoon of oyster sauce and mix up well. Season accordingly with soy sauce and white pepper powder. Plate up and garnish with finish sliced fresh chilli, and a small crack of black pepper. As I’ve said many times before, Sunday mornings are times when you truly have the opportunity to make a good breakfast for yourself. 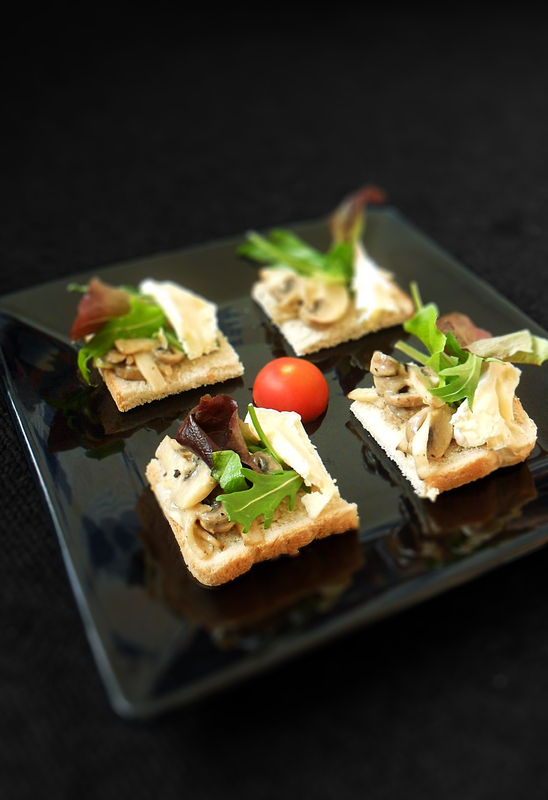 Here’s what I had this morning – Mushroom and Brie Bruschetta (pronounced as [brusˈketːa]). In a hot skillet, toss in sliced mushrooms with a small knob of butter. Add a small pinch of basil and season accordingly with freshly ground sea salt and black pepper. Once the mushrooms are just about browned nicely, add in a tiny bit of cream just to hold everything together, then turn the heat down low. The bread should be done, get it out. Half a clove of garlic and rub it on the toast. Spoon some mushrooms onto each slice and accompany with a small handful of fresh greens, holding them down with a small wedge of Brie. Serve with fresh cherry tomatoes, and without cutlery. All hands, all goodness. 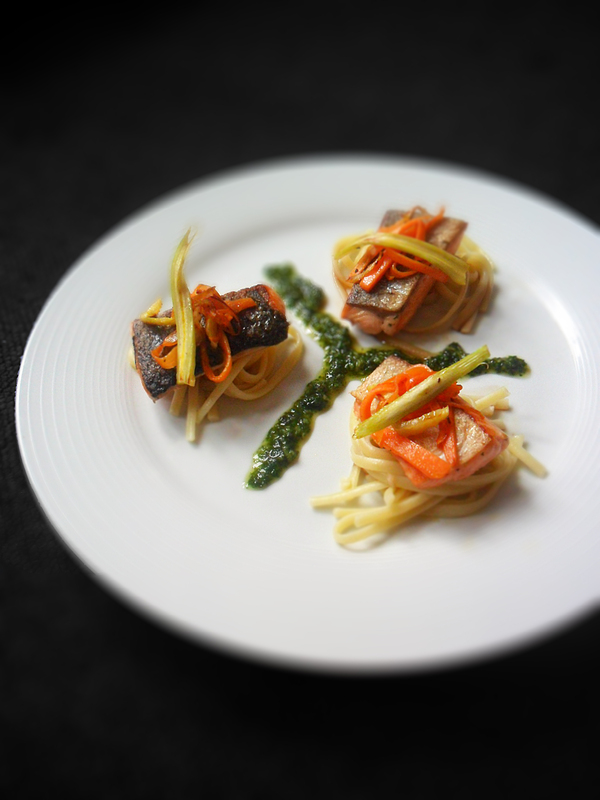 Seared salmon with sauteed carrot and fennel, on linguine dressed with balsamic vinaigrette, served with a mint and garlic sauce. Set the linguine away to cook in a pot of boiling water. Drain once cooked, and toss in a balsamic vinaigrette. With a small knob of butter and a little splash of olive oil, saute the julienned carrot and fennel. Season with freshly ground black pepper and sea salt. Remove once vegetables are cooked. Prepare your salmon fillets, cutting them into small rectangular pieces. Salt the skin generously with seasalt and lay them skin side down on a piece of kitchen towel. Chop up a handful of mint leaves and mince it together with a small clove of garlic. Transfer to a mortar and pestle, add a little drizzle of good extra virgin olive oil and pound away till everything comes together as a sauce. As soon as the vegetables are out of the pan, sear the salmon fillets skin side down till golden. Flip the fillets after the skins are nicely browned, and remove once they are done. The pieces of salmon should be firm not hard, nor soft. Let them rest on a fresh piece of kitchen towel before plating up. 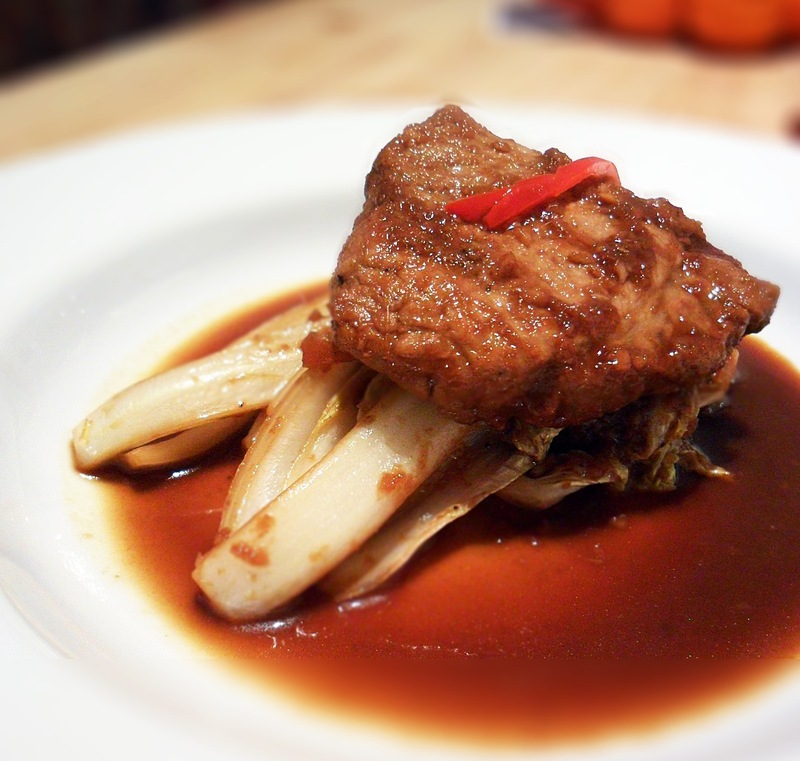 Pork shoulder fillet braised in garlic, ginger and honey north of carrot and red chilli, served on wilted Chinese leaf. In a skillet with some water, make a broth of minced garlic, ginger, soy sauce, carrot and red chilli. When the water comes to a boil, incorporate about a tablespoon of honey, depending on how much broth you’ve made. Taste the broth, it should be a sweetish-salty flavour. Set in the fillet of pork and braise till done. When the pork is almost done, add in the Chinese leaf and remove all once cooked. Inspired by Aglio Olio and the lovely pork and asparagus combination, here’s a quick spaghetti dish to whip up that’s sure to satisfy your craving for that saltish non-slurpy pasta. As always, first get your spaghetti into a pot of boiling water. Drizzle the wok with a little bit of olive oil, and toss in the sausages. Make sure the skin’s removed. Let it sizzle for a bit, so the fat gets rendered out. Then, in goes the garlic, fried till golden. Toss in the peppers and asparagus. Your spaghetti should be about done now, if not already done. Drain and add to the wok. Dish it out onto a pretty plate, with a generous pinch of arugula atop. Using a speed peeler, strip a more than a couple of slices of Parmesan on. Drizzle a round of olive oil and serve. To yourself, of course. 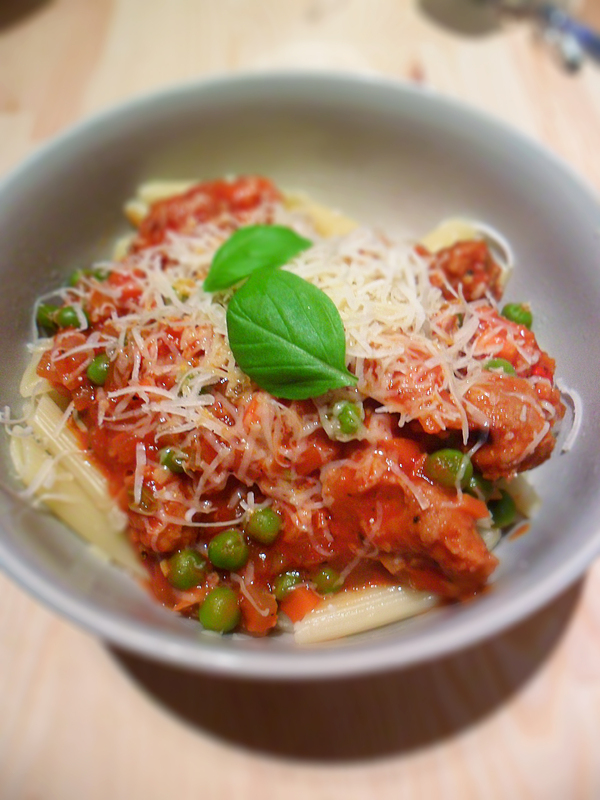 Even though I think the best way to have Bolognese is with spaghetti, sometimes penne is a pretty good change. Served in a deep bowl, all you need is a fork to stab and shove. Get your pasta boiling in a pot. In a hot wok, toss the peas in. Once they’ve defrosted for a bit, dump the carrots in, together with the small small wad of butter. Toss. Then add the garlic and onions. Let them fry away happily, tossing occasionally. If you want it slightly spicy, add in the chilli now. Peel of the skin of the sausages and throw them into the wok. Cut them erratically with a spatula whilst stirring everything together. Scoop out some of the starchy pasta cooking water and pour into the wok. Stir in the tomato puree and add more pasta cooking water accordingly. When you’ve got the consistency you want, and the sausages cooked, pinch in the dried basil, salt and pepper. Stir and turn off the heat. Serve with bolognese. Garnish with Parmesan and fresh basil leaves. 15-minute meal for the famished soul.